Far better than its predecessor, the 760p series is the best value for fast NVMe storage. Intel's new mainstream SSDs finally deliver on the promise of NVMe without any serious compromises. It's SSD week for me, as two of the biggest players in the market launched new drives today. I looked at the new Samsung 860 Evo SATA offerings earlier, but Intel has bidden farewell to the old interface and is pursuing higher performance with NVMe drives. Intel already reigns as king of the hill with the extremely fast—and equally expensive—Optane SSD 900p series, which launched last October. For mainstream customers, Intel uses its own 3D NAND with licensed controllers, like the SSD 600p's SM2260 from Silicon Motion, with a far more affordable price but sometimes questionable performance. While I wasn't provided full specs for all capacities, the above 760p specs are for the 512GB model that I'm reviewing. The 600p didn't actually hit full performance until the 1TB model, though the 512GB model wasn't too far behind. In practice, however, the 600p remains one of the slowest NVMe drives on the market. That's thanks in part to the first-generation SM controller, which keeps costs down by not including any DRAM. The new 760p model includes DRAM (there are two packages on the PCB), presumably with larger quantities on higher capacity models. I'm still trying to get precise values, but combined with the DRAM and improvements in the controller, firmware, and other aspects, performance and efficiency is much better than the 600p, and at the same price point. What will be interesting to see is what happens with some of the other upcoming NVMe drives. Some omit DRAM but use NVMe's Host Memory Buffer feature, which can use some system RAM to cache frequently referenced data (like the NAND mapping table). That should keep pricing down, but how it impacts performance is a bit of a wildcard. Launching today are the 128GB, 256GB, and 512GB models, with 1TB and 2TB slated to arrive later this quarter. Pricing starts at $74 for the smallest capacity, $109 for the 256GB model, and $199 for the 512GB drive I'm looking at. If you want the added security features of the Pro 7600p line, each capacity costs $10 more than the 760p. And just for kicks, if you're interested in the E 6100p line, the 128GB model costs $79 and the 256GB model costs $119—though I don't have any other details on those drives. Intel rates the 760p NAND endurance at 72TB per 128GB capacity. That ends up being very similar to Samsung's newly released 860 Evo line, which has an endurance rating of 300TB per 250GB capacity, and it's quite a bit better than the 100TB per 250GB capacity rating Samsung uses for its 960 Evo line. Of course it's not just about endurance, there's the matter of performance. For the performance testing, I've highlighted the 760p in the charts in green, and I've also included the Samsung 860 Evo 500GB as a representative of one of the fastest SATA drives (though it does trail other SATA offerings in some disciplines). Intel's 760p nominally costs $30 more, which works out to $0.389/GB compared to $0.34/GB for the 860 Evo. Another data point you'll want to pay attention to is the Samsung 960 Evo 500GB, which has a higher price of $0.456/GB, but does deliver somewhat better overall performance. The thing is, pure SSD performance starts to become far less important beyond a certain point. For many people, even a good SATA drive remains plenty fast, though if you have a newer system I generally lean toward M.2 NVMe drives now. For tasks like loading games and booting Windows, there's not much difference between a modest SATA drive and the fastest NVMe drives—maybe a few seconds at best. But if you do any storage-intensive work (maybe you run multiple VMs on your PC workstation), the difference can become more meaningful. Intel's new 760p 512GB sits pretty much smack in the middle of the charts. That might not seem all that great, but as I said above, often it's a question of balancing price and performance. You'll notice that the new Samsung 860 Evo basically gets pummeled by the NVMe drives, only coming ahead of a few models in a few of the tests, but it's really not much of a competition. Considering the relatively small difference in price, it's easy to see why I recommend NVMe for newer system builds wherever possible. Of course, you can save about $60 if you go with a slower SATA model, and you still may not notice the difference, but I also appreciate the lack of cable clutter that you get with M.2 drives. Looking at the individual charts, in the mixed read/write IOMeter testing, I use mixed read/write levels from 100/0 percent to 0/100 percent in 25 percent intervals, with 128K sequential and 4K random, and then take the geometric mean of the five tests. Each test runs for six minutes, so this is an extremely intensive workload, and it shows which drives hold up under the most demanding scenarios. The 760p can't keep up with the better drives, but it still more than doubles the performance of most SATA drives. The file copy test (about 8,800 files totaling nearly 20GB—the Batman: Arkham Origins folder contents) tells a similar story, because it's reading and writing to the same drive. Moving to less stressful testing, the pure sequential read/write performance is quite high, and the QD1 random performance also looks good. Most everywhere else the drive falls in the same range as a lot of the other NVMe drives I've tested. But the caveat is that, assuming Intel can deliver sufficient quantities of the 760p, it's the least expensive 512GB-class NVMe drive on the market. Only a few others like the WD Black and the outgoing 600p can match its price, but those are substantially slower drives. Most users don't go into a new PC build with an unlimited budget, and that means you need to balance performance, capacity, and features against the almighty dollar. Just as the GTX 1070 and 1060 end up being far more popular graphics cards than the GTX 1080 Ti, a balanced approach to storage often trumps raw performance. As nice as it might be to dream of storing all your games on a 480GB Optane 900p, or maybe one of the future 1.5TB models that are apparently in the works, the reality is we're usually forced to go with less extreme solutions, and it's here that the 760p series stakes its claim. The 760p is never at the very top of the performance charts, but it also avoids falling to the bottom—something which couldn't be said of its predecessor. But there is one chart where it does come out on top, and that's in overall value. Looking at current SSD prices, the 760p 512GB currently represents the best overall value for storage, at least in the US market. The UK pricing wasn't available, and we used the estimate of £199, which may be a bit high (depending on VAT and other factors). Even so, it's also one of the better values in the UK market. Check regional pricing and look at the 960 Evo 500GB as the chief competition. If there's more than a 10 percent price premium, then I'd generally lean toward the Intel 760p. As for the previous generation 600p, it's almost no contest. The lower capacity 600p models were often slower than a good SATA drive, and many reviewers bashed the drive badly enough that Intel stopped sending out any further samples. I didn't think the drive was as bad as many, mostly because I didn't view it as top performance option, but it's hard to argue with the lackluster performance in random IO and heavier write workloads. I do need to mention one other item as a final thought. Since Intel is using a third-party controller, there's nothing to stop other manufacturers from delivering similar performance. In fact we saw at CES that Mushkin and sister company Edge Memory both have SSDs using the same SM2262 controller slated to launch in the near future. The paper specs look strikingly similar to that of the 760p, though with the use of Host Memory Buffer and without any DRAM. Intel does have a good reputation for tuning firmware and reliability (eg, if you go back to the SandForce days, Intel was one of the few companies to avoid some of the reliability issues that came up with the SF-2281 controller), though it's not perfect by any means (see: Meltdown and Spectre). There's also the element of price, and since Intel controls its own 3D NAND fabrication it should have an advantage. 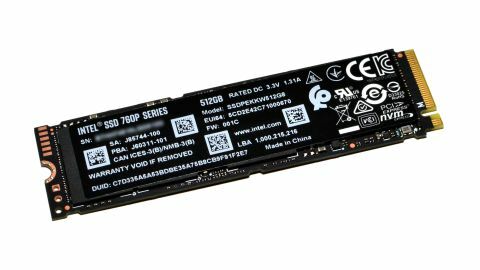 If you're in the market for a new PC in the coming months, and you're willing to pay a bit of a price premium for NVMe storage, Intel's SSD 760p series makes a strong case for being the drive you should use. Unless you're after maximum performance with less regard for pricing, in which case the Samsung 960 Pro still tops the charts for M.2 storage, while Intel's Optane SSD 900p easily takes the pole position for performance. Regardless of which drive you choose, competition in the market is good, and after 18 months of slowly increasing SSD prices, hopefully we've reached the summit and are starting back down the hill. We should also see NVMe pricing start to encroach on SATA territory, which will be a welcome change.